Looking for a flavor-filled, blue highball with a cool visual effect that is fun to build? The jellyfish is the cocktail for you! 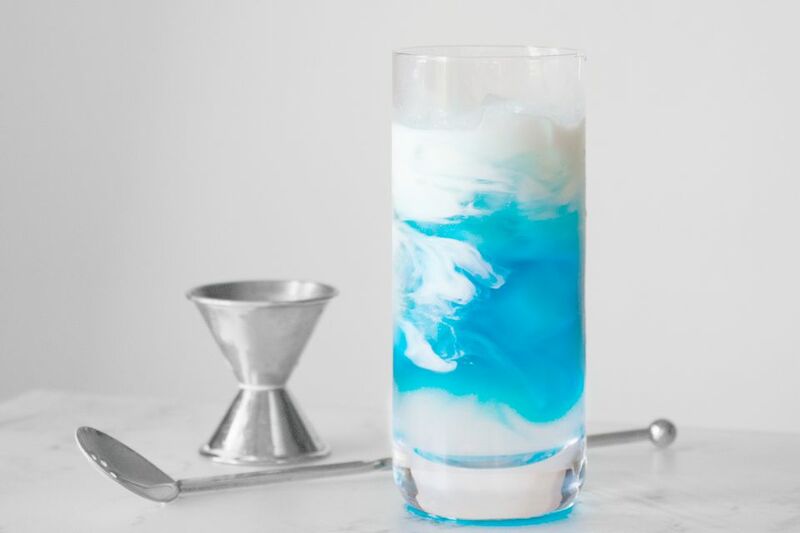 It has the appearance of a Caribbean-blue sea with white tendrils floating around that gives the cocktail its marine-inspired name. You can serve this at a party while practicing your bartending skills and it's a ton of fun! The jellyfish is not only visually impressive, but it's also rather tasty too. It uses a vodka base with orange and anise flavors contributed by blue curaçao and white sambuca. This interesting combination is topped with cream, which is how you'll create the jellyfish. To obtain the full effect of the drink, you will want to slowly pour the ingredients over one another so they float. It requires patience and a little practice, but these particular ingredients are some of the easiest to layer. Fill a highball glass with ice and add the vodka. Float the blue curaçao slowly on top by pouring it over the back of a barspoon and trying to minimize the mixing of the liquids. Float the sambuca on top in the same manner. Float the cream on the very top. Stir delicately and slowly as to not ruin the "jellyfish" effect. While there are other colors of curaçao available—clear (called "orange") and green—the look of the jellyfish cocktail relies on the blue-colored liqueur. You can also find blue curaçao in a nonalcoholic syrup. Just be aware that this may have a different specific gravity than the liqueur and may not create very distinct layers. Sambuca is an anise-flavored liqueur that is often compared to the taste of black licorice. It also comes in different colors—primarily clear (called "white") and black—with the white being the most popular and common. The heavier the cream you use, the more distinct the jellyfish effect will be. Heavy whipping cream is the thickest available and is an excellent choice because it will barely mix in with the rest of the drink. A standard cream or half and half would be good as well. You'll find that milk is too thin and will likely blend right in. As for the vodka, go ahead and use your favorite "well" brand. The jellyfish is designed to be more of a novelty drink than anything else and there's really no need to pour your best vodka with all these flavors. That said, you'll find it best to choose a clean tasting vodka; there are quite a few worthy brands that remain very affordable. Black sambuca could be a very interesting twist in the jellyfish because it offers a great contrast to the white cream. It would be a fun substitute for Halloween parties. How Strong Is a Jellyfish Cocktail? The jellyfish is fun, funky, and surprisingly strong. Even with the cream, the three liquors add up to an average alcohol content of 28 percent ABV (56 proof). That's hefty for a highball drink, so as tempting as it may be to have a few rounds, you're taking a chance on getting schnockered!